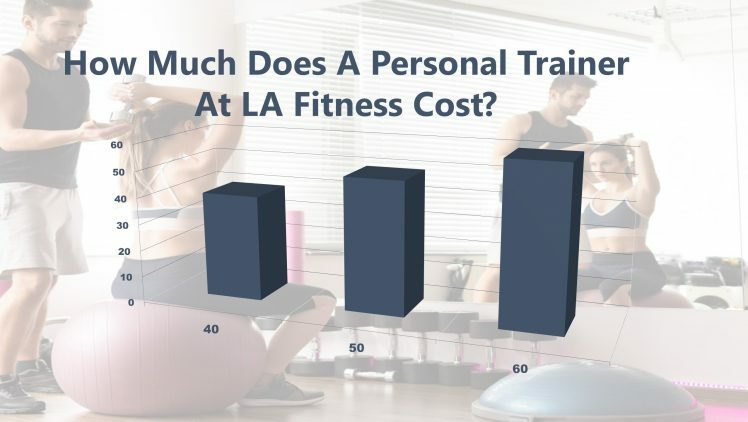 Body Smith Fitness > Personal Training > How Much Does A Personal Trainer Cost At LA Fitness Cost? The average price of a 60-minute session with an LA Fitness trainer is $50. Prices ranged from $40 to $60 for a 60-minute session with an LA Fitness trainer depending on their experience for the US in 2019. LA Fitness prefers you to commit to at least 12 months so you will be looking at yearly costs ranging from $1,920 to $2,400 per year. With over 800 clubs across the US and Canada, LA Fitness (founded in 1984) offers a wide variety of state of the art gym equipment and a wide range of amenities as well as their personal fitness trainers. For example, a forum post on bodybuilding.com from someone claiming to be a former trainer at LA Fitness stated there as a $99 enrollment fee, a processing fee of $50 and up to $60 per session if a five-pack session was purchased. A post on sparkpeople.com states their experience at LA Fitness where the trainer informed then the charge would be $55 per hour for a master trainer, or if they preferred a personal trainer, the total would be $40 per hour. Regardless of what option the customer chose, both came with the requirement of a 12-month contract. A former customer of LA Fitness made a post on pissedconsumer.com that they were charged $880 when canceling after 1 month of a 12-month contract. This represented 50% of the remaining 11-month contract. This would seem to be a standard operating procedure those who wish to cancel early must go through. Development of an individual, customized written workout. Accessibility to your trainer between sessions for questions. Assist with any particular need you may have. Create weekly reports to chart your progress. A journal to record your achievements. A fitness trainer will have a certificate in fitness training or a degree in exercise science. At most gyms, a fitness trainer can evaluate and screen participants to help them achieve their goals and exercise routines. More advanced trainers may be able to assist as well with things such as chronic health conditions. If you are not already a member of LA Fitness, you will require a membership, perhaps including a one-time fee of initiation ($50 to$150) and around $35 per month in membership fees. Purchase special food you would not usually buy if you are following a special diet plan. Define specific goals and want you are wanting to accomplish with your trainer. Make sure you are a match with tour trainer in terms of expectations, personalities, and priorities from the outset. At the start take some time to determine if your goal is to build muscle, lose weight or maintain a healthy figure and weight – let your trainer know this so you can work best together. Make sure your trainer has up to date and current credentialing from organizations such as the National Strength and Conditioning Association, American Council On Exercise and the National Exercise and Sports Trainer Association. There is a high turnover of staff with many franchised gyms so you may not always work with the same trainer. Check the fine print of your contract, especially the refund and cancelation policy. There might be a hefty termination fee if you were to break a 12-month contract. LA Fitness sometimes offers discounts or special promotions. If you can commit to the trainer, the less you can pay per session. Remember you can save money often by working with individual personal trainers who are often a fraction of the cost of those who work with name brand fitness centers. Don’t just accept the first offer you are given. If you plan to work with a personal trainer and show some commitment they will always lower the costs – but you have to ask! Start your personal training in Chandler or Tempe with BodySmith Fitness today. Check out our personal training deals.